If you've strolled along any of the beaches around Tofino, there is a good chance that you've stumbled across a sand dollar. The fragile disks with their telltale floral designs can be found all over the sandy beaches of Clayoquot Sound. 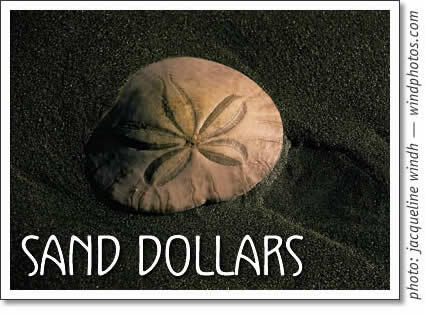 Sand dollars are found in temperate and tropical oceans throughout the world; usually found in shallow, sandy areas. They are from a class of marine animals known as Echinoderms, which literally means "spiny skin." They are closely related to sea cucumbers, sea urchins, and sea stars. The outer shell of the sand dollar is made up of calcium carbonate and is called a test. These are the hard white shells with flowery designs that we commonly find washed up on the beaches around Tofino. When the animal is alive the test protects its tissues and organs. When they die, the insides rot away, leaving only the test to drift up on shore. When alive they look like they are covered in a fine layer of hair. These are actually small black spines and tube feet that cover a sand dollar's test and are used for movement and feeding. They allow the animal to slowly move along the seafloor, burrow into the sand and trap organic particles that drift by in the water column and cling to sand. In British Columbia there is one species of sand dollar called the Dendraster excentricus. They live in the lower intertidal zone and up to six metres deep in the subtidal zone. Their basic structure is very similar to a sea urchin, with the small spines and tube feet common amongst all echinoderms. The sand dollar has no head or tail, no front or back, instead it has an "oral" side on the bottom and an "aboral" side on the opposite surface. Looking at a sand dollar test you will see a small hole in the centre of the oral side. This is where the creature's mouth used to be. Surrounding the mouth you will see grooves cut into the surface of the test that look like river valleys. These are called food grooves. When living, sand dollars filter small particles of food that they ensnare with mucus between their spines. The food is then carried by cilia to the food grooves where the small particles are corralled to the mouth. On the aboral side of the sand dollar there are five indentations that make an easily recognizable floral design. These are called ambulacra, and are where the animal's gills are located. They have two different methods of feeding, deposit and suspension feeding. When deposit feeding they feed on tiny organic particles drifting in the water and attached to particles of sand. Specialized tube feet on the oral side form a funnel around the spines and transfers the food from tube foot to tube foot until it reaches the food grooves. When the particles reach the end of the food grooves there is a powerful muscle called the Aristotle's Lantern that is equipped with hardened teeth that crush tiny organic particles. Suspension feeding is a method sand dollars use in calm water. They position themselves so that one edge is buried in the sand while the other is sticking up vertically. Doing so enables them to catch particles in the water column just above the surface of the sand. The particles captured are transferred from the tube feet to the mouth in the same manner as deposit feeding. Sand dollars reproduce by a method called "broadcast spawning." When the temperature and salinity of the ocean are just right all of the sand dollars in a localized area will release their eggs and sperm at the same time. The eggs and sperm meet in the water and the eggs are fertilized. They immediately start developing into sand dollar larvae through cell division. They float around at the mercy of ocean currents continuing to grow as they feed on smaller organisms. After about a month the larvae settle down on a sandy area and change their shape into that of a sand dollar. They continue to grow until they develop into adults. Since sand dollars live in sandy locations the beaches around Tofino are an ideal place to collect their tests. The best time to search the beaches is after a storm as many of the dead shells are picked up by the increased wave action. Sean McCarroll is an outdoor and travel writer from Nova Scotia. He is spending a month in Tofino to recover from his journalism studies at the University of King's College.